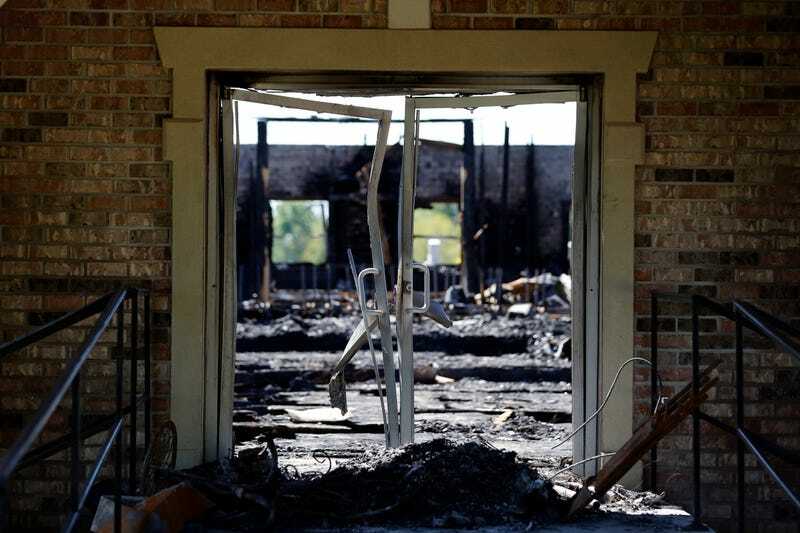 Police have taken a suspect into custody who is suspected to be involved in recent fires that destroyed three historically black Louisiana churches, according to CNN. The three fires over the course of ten days raised suspicions of arson. The suspect is a 21-year-old man from St. Landry Parish, located to the west of Baton Rouge. CBS News reports that his name is Holden Matthews, and that he’s the son of St. Landry Parish Deputy Roy Matthews, who reportedly surrendered his son to authorities. On what appears to be Matthews’ Facebook, he says he is a member of a black metal band named Vodka Vultures. The three churches that were seemingly the targets of arson attacks in the last two weeks include St. Mary Baptist Church in Port Barre, which burned on March 26, Greater Union Baptist Church, which burned on April 2nd, and Mount Pleasant Baptist Church which burned two days later, both in the town of Opelousas, where Matthews also apparently lives. The FBI and federal Bureau of Alcohol, Tobacco, Firearms and Explosives both involved in the investigation. Authorities say they will hold a press conference “to announce significant updates” in the case Thursday morning at 10 a.m.